There comes a time in life when the years have accumulated under an expanding waistband, and we wonder where they have gone. For many retirees it is a time of family, travelling, giving back to the community and self-indulgence after a lifetime of service to others. As a retired couple always looking for an unusual travel destination, we readily accepted an offer to crew on a yacht accompanying a rally to the Louisiade Islands in eastern Papua New Guinea. After anchoring at Panasia Island, our first meeting with a member of the local community was preceded by a soft tap on the hull of Moongara and a gentle “Hello”. The four crew rushed up on deck to find a dugout outrigger gently bumping the green side of the yacht. Four pairs of large brown eyes and four wide white-toothed grins greeted us. The oldest child who must have been around ten was accompanied by descending ages to a little girl, barely three, furiously bailing water from the bottom of the flimsy craft, with a cut-off plastic container. “”Hello Dim Dims, welcome to Panasia Island. My father sent us out to greet you. He will be along soon. Would you like a lobster?” said the eldest boy in excellent English. Would we like a lobster? We had been asked to bring trade goods as there are no shops on most of the dozens of islands. We quickly found a couple of T-shirts, some exercise books and pencils, some lollies and several colourful balloons in exchange for two fat lobsters. Soon a Sailau, a native outrigger sailboat rafted up beside us, and Mackenzie and John, the traditional owners of Panasia Island, climbed aboard Moongara. They accepted a cup of coffee and soon we were being told about their island, the Louisiades and given an insight into the local customs. Oh, and Dim Dim is the local name for white people, not a slur on our intelligence. Moongara, one of the fifteen Australian yachts participating in the 2009 Louisiades Rally, a six-week expedition partly sponsored by the Papua New Guinea Tourist Authority and Eco-Sustainability Tours, was the oldest yacht in the fleet. She was a slow but comfortable ketch some 13 metres in length, with her crew celebrating a successful but rough passage of four nights and five days across the Coral Sea, when the delightful visitors arrived. The rally's aim of bringing people of both nations together in trading, dance, singing, and co-operation was wonderfully fulfilled and acceptance between rather well-travelled yachties and very simple islanders ran high. Their excellent knowledge of English, a legacy of mission education, helped to open hearts and minds to each other, as we enjoyed gatherings of welcome on several islands. The organiser of the Rally had been to the Louisiades for the past two years preparing the event and Mackenzie and John were ready to extend their hospitality to us all that evening. They made their way around to welcome all fifteen yachts before heading back to shore with armloads of items virtually unobtainable in the Louisiades. That evening fifteen dinghies carrying around 55 Dim Dim yachties headed for the small white sandy beach for cocktails and a BYO BBQ, to discover the men had built a long bamboo table to hold our food and several benches on which to sit. Soon the yachties, most of whom were in their 50's to 70's, and an equal number of islanders, including many children, were chatting away as though we had known each other for years – just like an Aussie backyard BBQ, and indeed, one of the yachts carried the large 'rally BBQ' which saw many beach BBQs during the following six weeks. Many of us had caught large fish to share with everyone. The following morning the fleet weighed anchor for Nirvani, near Panapompom Island, where we were welcomed ashore by a great cultural event with singing and rather threatening dances. Next day the Panapompom Regatta began with local people competing against Dim Dims in gero (swimming) and esobu (canoe) races. They won most of the events. After lunch, four Sailaus conveyed yachties on an exciting sail to Panaete Island, the only island where the Sailau and larger Lakatau boats are built. It is doubtful if any of the experienced yachties could have sailed these basic outriggers, but the locals were experts. After safely returning to Nirvani, everyone participated in a mu-mu, food cooked in an underground oven, followed by prize giving for the day's games. 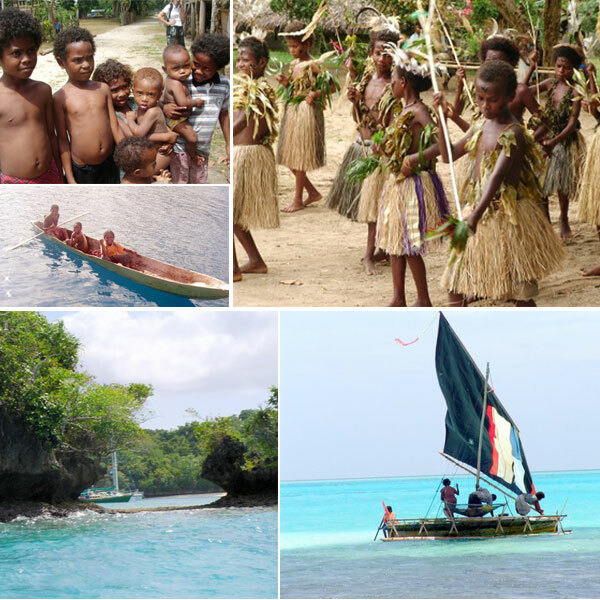 Sailing the turquoise and ink-blue seas between islands proved easy and we often carried locals to and from their villages, where they openly welcomed us into their lives, introduced us to elders and children, and loaded us with pawpaws, mangoes, coconuts and fish. At the Bagoman Muster, a day of traditional entertainment and feasting, with many carvings, woven mats and baskets and shell necklaces available for sale. By the way they laughed, it seems the local people had never seen anything so funny as 50 Dim Dims dancing with them, trying to learn the traditional dances. By evening the lassitude syndrome hit hard and we retired to our yacht homes to participate in the daily 5 o'clock somewhere ritual. Nimoa Island, far to the east in the Louisiades, is run by the Catholic mission and an elderly priest called Father Tony. Sister Sarah presides over an excellent clinic with a maternity ward, a general ward and an outpatients clinic. She was kept busy patching up infected wounds of yachties, from coral, sea urchins and too much time in salt water. The rally organiser had asked us to bring whatever medical supplies we could find to donate to the clinic. The total gift of over $6000 was three times greater than the clinic's annual operating allowance from the PNG health department. If there is a highlight to this most interesting journey, it would have to be the sports day between the soccer team of local kids aged about elevan beating the yachties, mostly grey beards; and netball between teenage girls and Dim Dim women who recalled dimly remembered skills from somewhere deep within, while ignoring aching limbs. The girls also won. The most rewarding aspect of this rally was the total acceptance and sense of community which developed between affluent yachties and underprivileged islanders, who in no way can they be called 'poor' for their life is rich in community spirit, excellent food and tribal lore. They are rediscovering their traditional culture now that the missionary zealots are no longer dominant and enjoying life as best they can. Then a magazine article caught his eye, like a shape on a radar blip. Inspired his heart and mind to join this adventurous escapade. At sea again with sails unfurled with the skipper and his mate. Their first anchorage was Herald Island, an easy sail, much to their relief. To find a dozen other yachts already forming a cohesive mob. For to come unspliced when out at sea can cause crews to come to blows. Squalls, strong wind and high seas, caused most of the skippers to frown. Setting off on another adventure, with Moongara bringing up the rear. Whilst others sat gazing at rolling waves, and skippers lovingly filled in their logs. On that great ocean highway of commerce, we looked up in awe to their heights. So all chose to up anchor and sail to Panasia, sheltered in the lee of high hills. Welcoming smiles from the locals, who constantly visited to trade with our boats. And with a big smile calmly told us, that on these bones his ancestors once fed. Delighted the yachties who'd climbed through a small hole via two ladders. Where the locals welcomed us with flowers, and entertained with dances and games. Had yachties amazed at the skill of the sailors, who managed to keep them afloat. A feast of the natural bounty, of fish, yam, pork, pawpaw, such a treat. Locals in outriggers called at each yacht, to trade fish, fruit, carvings and crays. We were welcomed ashore by school children, dressed in their traditional garb. Led us in procession to an arena where we would spend the next few hours. Kept us pinned to our seats in the hot sun, while the Miss Misima contest we saw. Each dressed in her grass, shell and flower costume, shyly smiling, a little in awe. Greybeard yachties played ballgames with youngsters, after enjoying a delicious feast. With photos, souvenirs and memories, stories to share with loved ones at home.